The recently introduced table of rides has two new features: Searching can now highlight rides that match the search instead of only showing rides that match the search, and a CSV representation of the data can be shown with the click of a button. When showing CSV, the data can be separated by either commas or tabs (TSV). Tab separated data can be copy and pasted directly into Excel or other spreadsheets, while comma separated data can be saved in a plain text file and consumed by programs. 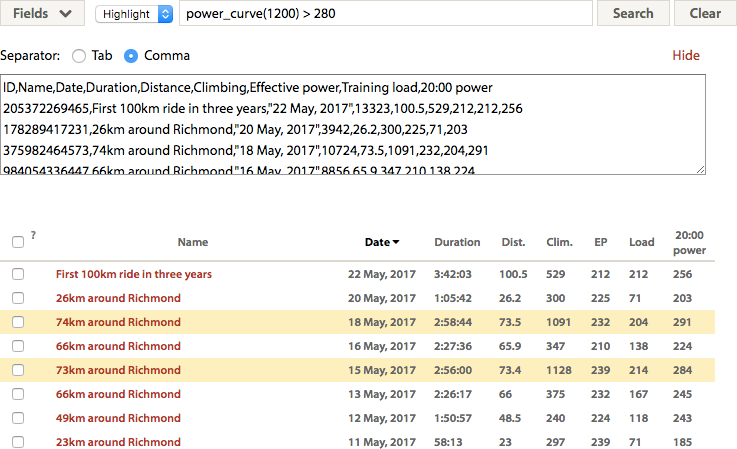 The power curve chart has been updated so that the time labels can be clicked on, which is equivalent to clicking on the chart at that time (so it “freezes” the chart at the given time, which means that the information box doesn’t move so rides in the box can be clicked on). This makes it easier to see the values for the round times shown as labels (i.e. twenty minutes), rather than trying to move the mouse to the perfect position. Only the power curve chart on the power curve analysis page behaves like this at the moment. The settings for the training load chart (such as initial values and data source) have been moved from the profile settings page to the training load chart page. Apart from being a more appropriate place, this makes it easier for coaches to adjust these settings for their athletes, as they don’t have easy access to the profile settings. One change where the details probably don’t really affect anybody is that the text in ride notes and plans is now turned into HTML using a faster and simpler approach than Markdown, which was previously used. Markdown allows plain text to be turned into HTML with features like bold and italic text and lists and headings, but in practice this led to surprising formatting more often than not. The new one still turns URLs in text into URLs that can be clicked on. The other advantage of this change, and the impetus for the change, is that it is much faster to load some pages when there are many plans. The “edit ride” page shows the highest power outputs in the ride, along with the surrounding seconds, by default, as one of the main uses of the page is to remove power spikes. This has always been like this, but now there are options to show cadence and heart rate spikes as well. ThB and SmO2 (also known as total hemoglobin concentration and saturated hemoglobin percent) sensor data is now read from FIT files and can be shown on the main ride chart. This data requires a BSX Insight or Moxy or similar muscle oxygen monitor. The API now provides access to the raw ride file that was originally uploaded. Details are in the API documentation. Flexicharts now support PWC130, in addition to PWC150 and PWC170.